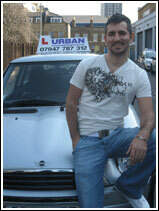 "Learning to drive made very simple"
Duncan Smith, passed second time, October 2006 at Barnet. If you would like to learn to drive at a much quicker pace, and your schedule allows you the flexibility to do so, then why not take advantage of our fantastic 40 hour intensive course. This course is designed for a completely untrained driver and is priced at £720 (excluding car hire for the day of the test). The training for this course will be spread over a 2 to 6 week period and will be tailor made to suit your timetable. You will need to contact Urban so we can give you a step-by-step guide on the strategy of the course. We will advise you on the theory and hazard perception test which must be completed successfully before you can take your practical driving test. Intensive driver training is a method of learning to drive that is preferred by many people. The results of this course are extremely rewarding. Are you interested in the 40 hour intensive course? If the answer is YES then contact Urban now and take advantage of the very best intensive course around at unbeatable value.